Both runs were pretty short and sharp covering around 40 minutes in duration. The pace felt pretty comfortable, although to achieve my desired time in the marathon I will have to run faster than this for the entire distance. The strange thing is that since I have been taking things easier in the last week I have actually started to feel stiffer and a little more lethargic. Apparently though this happens to a lot of people, judging by the number of posts on the runners forums. Tomorrow will be the first day of carboloading. I will be following the advice of 3 days of carboloading prior to the big event. In addition I will not be doing any running whatsoever for the next 3 days. As those of you who know me may know, I have done quite a few half marathons in the past and till this day I have never carboloaded, so it will be interesting to see if it helps or not. Actually in the past I have never really followed any of the training advice on runners forums and tended to run fast during my long run, oblivious to my heartrate, do no carboloading at all, and on some occasions stay up late the couple of nights before the race. I see the fact that I am now following advice as a maturing of my character, a coming to my senses so to speak. 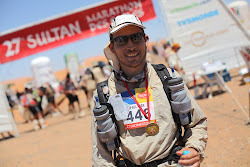 It is also a preparation for things to come, since I am under no illusion at all as to how much I will have to work to complete the Marathon des Sables. In this particular regard I will be following all the advice I can get. Just as a closing note for tonight's post, my weight when I started this blog back in December was 86kg. I am now under 82kg, so I have managed to lose 4kg of body mass and probably a great deal more of fat, since I will have gained significant muscle mass through my combination of running, indoor rowing, yoga and Pilates. I remember my first half marathon I was a student had been rather ill with gastro-interitus for two weeks up to the race, went out until 2am the night before to 'Steam Rock' for your sisters Birthday or something, but now if I train I still don't match the time I did then! Probably because I was 22 and 80kg now I am 32 and 95kg. Wow no wonder if you are 15kg heavier. Thats probably 30 seconds per mile slower just there. Can't you get your weight down to the same as it was back then? I am the same weight as I was back in uni now, so entering your 30s doesn't automatically mean you have to be heavier it seems. The other thing may be as we get older we are less willing to experience the same amount of pain we once were. The other point that may help is doing tempo runs to increase your lactate threshold. Next time I get the performance test I will see if I have managed to increase mine much. Despite the fact after the marathon I will be switching to the bike to train for the Marmotte, I will still keep up weekly tempo runs - around 10k or so.